Gauguin. Mahana no atua (Day of the God), 1894. The Art Institute of Chicago, picture courtesy of The Art Institute of Chicago. My thoughts on Gauguin Artist as Alchemist comes as the exhibition is close to the end. However, you still have a few days to catch the show before it closes on October 10 and heads to Pairs. So, go! This exhibit allows a rare glance at Gauguin and his art career beyond the time he spent with Van Gogh, which he is always synonymous with. Gauguin's ability to hold his own as an artist can be seen through his progressive paintings for the time, ceramic/sculpture pieces he jokingly refered to as "monstrosities", his impressive prints, and furniture pieces. At the end of this exhibit, I was left thinking Van Gogh no longer casts a shadow on Gauguin in my eyes. I wished I had seen this exhibit years ago. He traveled the world twice as a merchant marine. He was a stock broker before he became an artist late in life. He collected art before he became and artist. Gauguin. In the Waves (Ondine I), 1889. The Cleveland Museum of Art. picture by Sarah Meder. I took this picture of the above Gauguin painting. I wanted to recreate the exhibition wall it hung on so, I adding the beautiful yellow ocher with photoshop. Now you can see why this painting stopped me in my tracks as I turned one of the many corners of this show. I actually had to take a step back to take the whole painting in. The stop and go palette was exquisitely and brilliantly executed. The staggered movement of her body mimicking the rushing waves was so truthful. 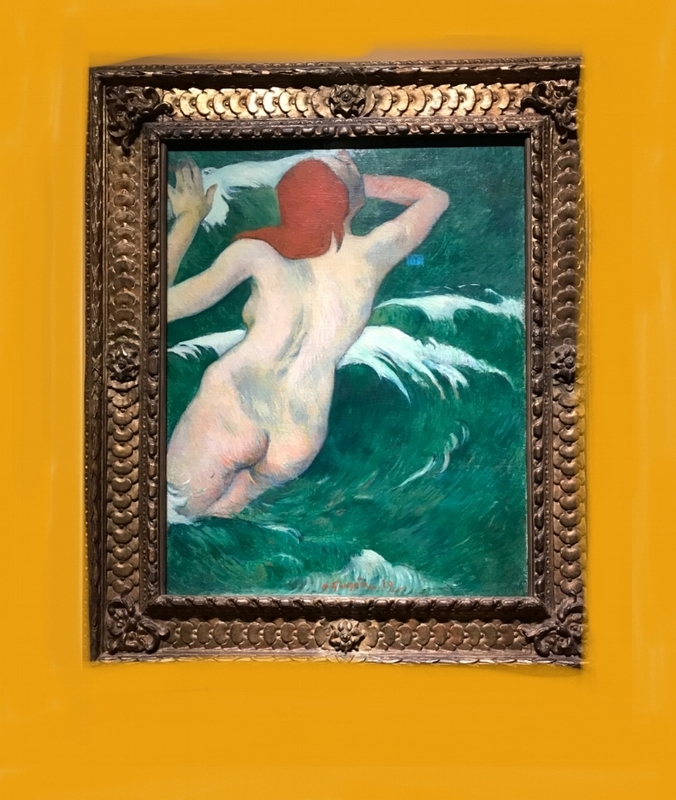 To top it off the yellow ocher, orangey wall (Interesting fact, Gauguin had his work displayed on colored walls like these) that surrounded this painting, blow this work out of the park for me. This is a painting I could sit in front of for hours. And then there were Gauguin's wood blocks. Works of art themselves, so beautifully carved each one more interesting than the next. Wood blocks are a great lesson in mark making, make sure not to ver look them! I could go on and on, really just make sure to catch the show if you can and see Gauguin for Gauguin's sake.